Since Bosch is the company that introduced us to the OIS (Oscillating Interface System) and has set the standard that most of the other brands are following, it seems fitting that they should be the ones to keep the flow of new blades and accessories coming. Titanium is the logical next step. Bosch has announced new Titanium coated 2-1/2" and 3-1/4" diameter circle and half-moon segmented blades. The coating is said to increase the life of the blade by 30% by reducing the heat that damages the blades. These blades can cut light-gauge metal including metal studs. Bosch is not the first to come out with titanium blades, but they are the first to come out with OIS titanium blades. 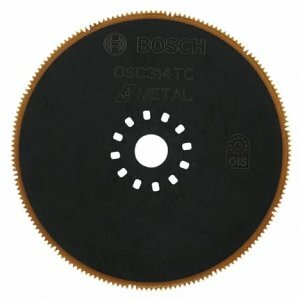 Bosch is also pretty well known for there blades so we would expect them to be top notch. Also announced were new Bosch 3Max tungsten carbide combination blades. These blades take both a carbide rasp and a carbine blade and put them into one package. These blades make it easier to go from cleaning out grout joints to then removing thinset. The blades also feature a tear drop shape that allows to blade to maintain a large surface area and still be able to reach into corners. Win, win.